As this election year is starting to culminate about, once again, the airwaves are being filled with promises of “Making Hawaii better.” The phrase sounds really nice and stirs up emotions in people to aspire to do such a such a thing when running for office. However, once in office, and seeing the kind of legislation being put on table, I start to think that these words are really meaningless. The working class citizens are struggling and I feel like the leaders don’t see this at all. Many like myself, are employed full time and making decent salaries but they sure aren’t going up any time soon. Nor has it gone up more than a percent since moving back home in 2006. What is going up is everything around here. From basic goods like food, housing, and utilities as well as taxes and fees, everything is rising except our incomes. I’m left with less money at the end of the month as a result. I could choose to work a second job to supplement my income, but there is no time when you have a young family, care for a disabled grandmother, and already holding a 40 hour a week job. I can only handle so much and want some semblance of a decent quality of life. I am not the only one who feels the squeeze of what’s happening. The elderly folks here are also feeling the same burden as working folks. They are on limited incomes and when the cost of goods and services rise, they have to figure out how to make ends meet. These folks are very much worried about how their incomes will sustain them as people are living longer too. When I start to hear the campaign promises of “I’m working for you,” I really want that person to genuinely mean it and show it in their actions. If you are making a promise, then you should actually keep that promise to fulfill your intent, if you really meant it. I teach my children to stay true to their word as it reflects our integrity about what we say and do. It is a duty to do so. Politicians are great at having photo shots of themselves with the “people.” Then they turn around and make laws that actually turn out to be bad for the people. What’s the deal here? Are you listening to us or only listening to the loudest of the activists with their demands and shortsighted thinking? That kind of decisions will only lead to many unintended consequences, which we have seen over and over again with poorly thought out legislation. The kinds of legislation being introduced this year are an interesting mishmash of interests to say the least. I read some of these bills and I have to scratch my head as to how does this help the working class folks and those on limited incomes. My take on it is that it sounds like a legalization of anti-everything rallies. When the word sustainable comes from something that Puna senator introduces, it only means one thing… Anti-GMO. The evidence has shown that people have died or been severely disabled by the consumption of raw milk and its products. We have a representative, who is aligned with groups that claim that GM foods are dangerous, but then wants to support raw milk. GM food has not killed anyone but we are trying to legalize something that has killed and maimed? Some thing does not make sense here! Once again, our brilliant legislators have decided to take on the curious consumers’ “right to know” claims to label food and punish anyone who doesn’t do so with jail, fines, or a lawsuit. That is a promising step forward to securing Hawaii’s affordable food supply indeed. Cell phones have been on the market for how many years without a single human test shown before it was released. More safety testing has been done on GM foods then on a cell phone. Now remind me why we need to label this? We’d better ask the state to also put huge signs all over warning us of the dangers of the sun and it’s radiation on every single home. That’s a proven danger that needs a label. This law sounds appealing in that it may raise the incomes of those making minimum wage, but you have to ask where is this going to come from? Someone is going to have to fund this raise. It’s going to come from the a rise in consumer prices as employers will have to reshift the burden of this. The raise in prices will also translate into higher costs to provide benefits to the employee also. If money grew on trees, this would be a great law but there is always a burden upon someone when only half of the issue is addressed in this case. The rise in minimum wage is to address the cost of living for people making it. Instead of tinkering with wages, why not look at ways to make the overall cost of living in Hawaii better for all? Raising the minimum wage is one of those shortsighted laws that will have more unintended consequences that will materialize after the fact. As I keep hearing more and more about these proposed laws, I have to stop and ask, “How does this make my life any better?” For the life of me, I can’t figure it out? Is any of these laws going to make living here more affordable? Is it going to truly improve my quality of life? Will it help those in need? Will it end our month to month struggles to make ends meet? Somehow it doesn’t even touch upon the key issues that the people Hawaii really could use about now. Does the public deserve some consideration on laws that will actually help them and make an impact on our daily lives? Yes, we all are expecting that right now. Our leaders need to sit down and ask themselves, “Have I really done something to better the lives of all in my communities?” Ask yourself if you’re work has actually solved a problem or added to the problem? 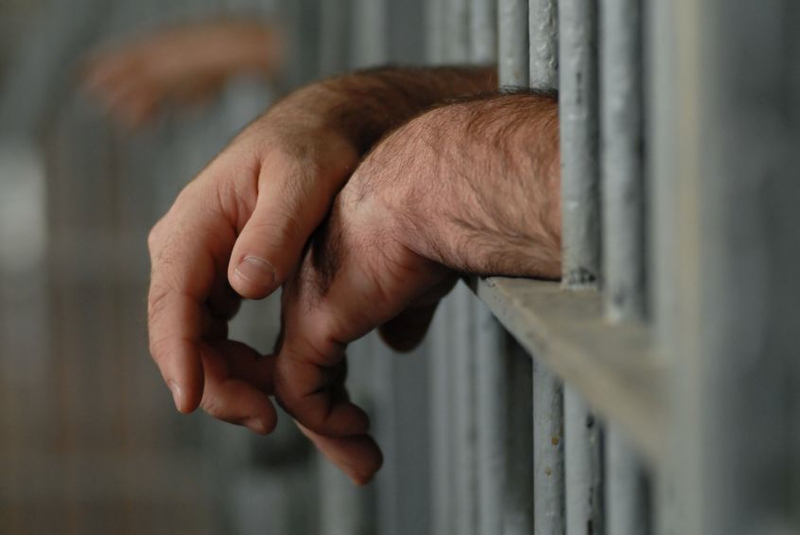 Have you take a consideration as to how your legislation will affect the entire system? If you haven’t, now is a time to delve deeper as to how everything is connected and interdependent. Please think about that and actually do what was promised during your campaigns. So many want to look at the “bigger picture,” but can’t even fathom where or how to even start to consider it. Everything affects everything is the bottom line. That’s the big picture… Look at the system you are trying to change. By seeing how the world is interconnected, you can have a better view of the consequences of your proposed legislation. We need that now. Please step back at the laws you are trying to make now and truly figure out what it will take to make the peoples’ lives better overall. That’s your duty to each and everyone of us! 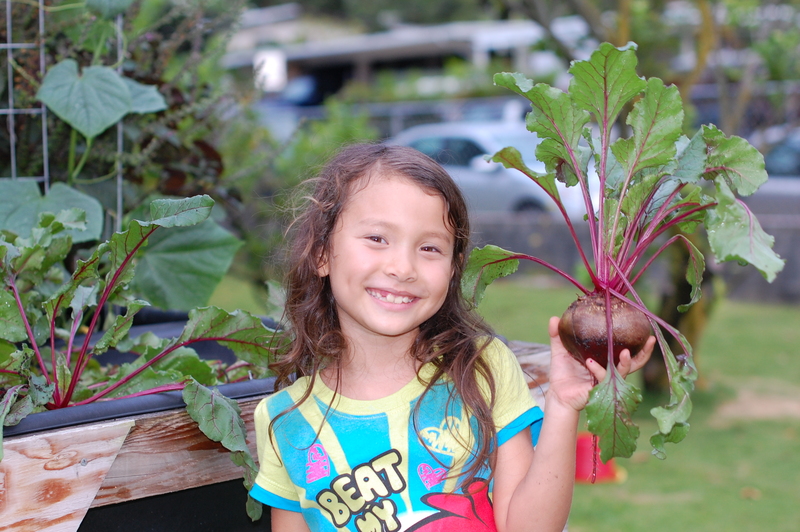 How Hawaii Will Achieve Food Sustainability: Jail a Farmer! Breaking News on GMOs: It made front page news today of the Star Advertiser that people want to have their genetically modified labeled. Well, a majority of some 642 people apparently do. So how are legislators attempting to satisfy what 487 people want? 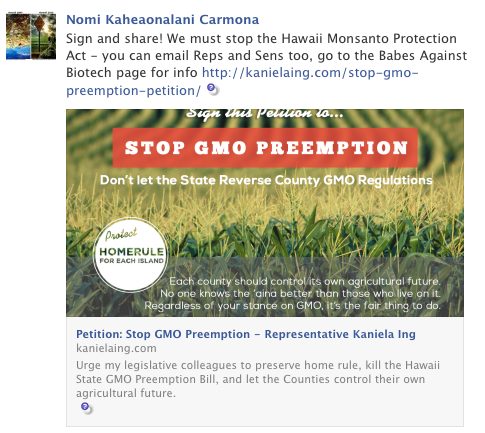 Of course we can’t quite figure out why this law is needed in the first place, other than people like Nomi Carmona, who believes that lilikois grow on trees and that there are GMO melons in Kunia. She apparently has an inherent “right to know.” She and others can’t figure out that foods without the organic label isn’t GMO and it’s a travesty. The others clamoring for this right to know also think that snowballs don’t melt because of chemtrails, since they apparently skipped out on science class to learn about something called sublimation. And if you read SB2521 carefully, it is all spelled out there on how they are going to enforce such a law. No one has yet to die of GMOs, but when and if it happens, our politicians will be there to save us from it with this label. Just in case it doesn’t kills us, they were trying to make raw milk more available to help address that issue. Yes, if that locally grown biotech food and other products aren’t labeled, you can get fined, jailed, and sued. Since the anti-GMO people can’t get it banned, the alternative is to jail the farmers and others who feed us. Earthjustice and Center for Food Safety is also ready to work for some dough to sue food producers and farmers if this benign food is not labeled. These two groups apparently had too many GMOs shoved down their throats laced with swigs of RoundUp unwittingly from being on Kauai several months ago, which caused them to develop a severe case of dementia as a result. That’s why they never went back to defend the county as promised. But hey, they had their colons cleansed back on the mainland with their organic food and are ready to jump back into the muck of Hawaii politics for the rubbah slippah folks! Hawaii politicians who put their name to this kind of bill should be highly commended for their skillfulness to craft laws that really look towards the future. The way to achieving affordable, local, and sustainable food supply is really simple. Jail and fine those farmers for growing food for us. That’s how our leaders do their best to support agriculture here. It’s a really proud day in Hawaii when the politicians show their thanks to the farmers! Welcome to your cold cell Mr. Farmer! I’ve noticed that several legislators have been celebrating the “home rule” issue when the Right the Farm act was being discussed. Home rule essentially means that counties can enact whatever laws that they feel necessary at their level. Many emails, tweets, and Facebook posts were posted by these leaders who decided to release their rightful reign on this issues to rogue counties like the Big Island and Kauai. I’m not sure why these legislators are so proud of letting counties have more power in dictating farm laws when the reality is, the state has the necessary resources to enforce and enact such laws. As I see it, these lawmakers have decided to not beef up their resources in their bills to address such issues, and failed to take care of the perceived problem, if any. The message I get from this kind of celebration is, “I have clearly failed my constituents to take care of their concerns at my level, so I will burden the counties with such issues.” The people asking for county laws claim that they have been failed by the state so that is why they are seeking county rule. Why are state legislators celebrating their supposed miserable failure to take care of this issue? If these people feel there was real harm done by the negligence of the state, why didn’t they take the state to court and sue them? While these lawmakers keep pushing the home rule issue, they are also talking on the other side of coin about food sustainability for Hawaii and keeping the country country. 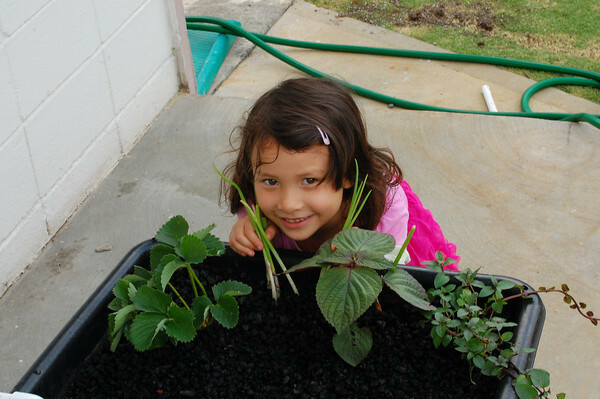 A certain handful of lawmakers have grandiose ideas of everyone in Hawaii having their own sustainable gardens to feed themselves. Of course, these will only feed themselves and not others. Certain lawmakers side with the keep the country country folks but don’t even take the time to hear the farmers out. The reality is that this kind of idea is shortsighted and poorly thought out. This will lead to many unintended consequences. With counties having to create their own regulating bodies to enforced these rogue laws, the money has to come from their residents. Residents will have to pay for all of this with increased taxes and fees. With the high cost of living already an issue, who has the time and money to start up their own gardens to feed just themselves? Financially, working a 9-5 job allows one to afford much more food than tending to a garden and more reliable for our food supply. How are the other residents like the seniors and disabled going to bear the burden of higher costs of living? Is this really the right way to do things for everyone? I guess in Hawaii, we celebrate our failure to constituents by letting others make bad laws that ultimately costs everyone along the line. It’s easy to talk about what is pono but apparently no one has really figured out how to walk the talk. As I write my thoughts on this blog, I have been quite direct in who I am targeting it towards. (Why beat around the bush and be coy?) I’ve seen many of these same politicians acting high and mighty with lots of their pandering followers giving their support. I find it quite funny how the followers of these politicians are so thankful and grateful towards them, but are down right nasty to others elsewhere who disagree with their views. As a daughter of a biotech papaya farmer, I’ve had my share of these dual faced activists’ comments. I chose to speak out for the papaya farmers because I know firsthand what happened to many of these farmers. So many lost everything to the virus and had to make up for losses as a result. Then when research provided a glimmer of hope and things started to look brighter, these farmers are subjected to the hate and misinformation campaign by these activists. They are ready to take away something from the farmers but have nothing to offer in return. Then when farmers start to speak out against them, they become targets themselves. I have been writing many politicians with my thoughts and opinions, as well as noting what I have seen being done by a certain class of them in office. When they are called out, these politicians clearly don’t like being targeted in my blog. Good because you can walk in the shoes of the same farmers who have been targets for the past several years now. You can also feel some heat that your fellow politicians who have helped us have experienced. When you as a leader fail to see how your proposed laws are affecting agriculture, the silent public’s opinion should not be discounted. Those who are unhappy with you are no longer going to grumble quietly to themselves and not say anything. We are coming out just like the activists too and we expect to be heard and considered. 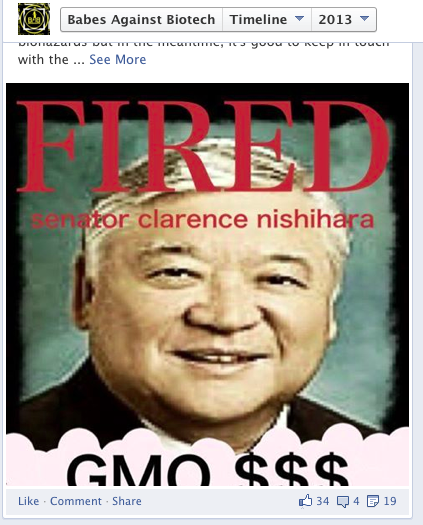 Leaders like Senator Clarence Nishihara, Representative Richard Onishi, Hawaii County Council Member Greggor Ilagan, Kauai County Council Member Mel Rapozo and Ross Kagawa, and Mayor Carvalho have all been targets of the activists like Babes Against Biotech, Hawaii SEED, and all the other anti-GMO groups. I have yet to see any other legislator stand up against these groups for these barrage of attacks that they levy towards these leaders. These groups enrage the masses with so much hate towards these people, while their preferred politicians quietly sit back and let it all happen. What’s even worse is that certain politicians then accuse farmers of being the bullies? Say what? What kind of leadership is that? The complacency sends me the message that they support this kind of tactics. That is truly disappointing to me. What leader fans fires? Unfortunately, we have many who have contributed to this problem. Some are driven by fear to sit back and do nothing, some are egotistical, and some are fueled by the highs of the moment. In either case, these are not leaders. However, when I, a single person, place my opinion on my blog about politicians’ actions, they don’t like it at all and have told me. I’m one person. I don’t go out telling hundreds of others to go after people. I state my take on the issue. If it hits a nerve with you, let’s talk about it. Babes Against Biotech and others sow seeds of fear and discord among hundreds that direct their spiteful words towards politicians either, and there is no condemnation of that by their preferred politicians. It’s allowed to happen right in public view. I am speaking my views and I don’t agree with what many leaders are doing and I’m telling them out loud. I don’t put out nasty memes of targets on people’s heads or photoshop them to look awful. I know that I must be causing a stir among our political leaders because I’ve noticed that I’ve been blocked by them on the social media. You know who you are and why you choose to do that. As a leader chosen by the people, I would have expected one to have a higher standard for one’s actions and consider the evidence and everyone that put you there in office. Sometimes the truth isn’t what you want to hear, and hiding from it under the loudest activist is the easiest and least painful route to take in the public arena to save your public office seat. Once again, Hawaii legislators have decided to take up the GMO labeling laws again. Here’s some of the activists’ reasoning why they are demanding such a law. -It causes every single disease on earth. -There are no safety studies that they like. -We are crossing and changing genes and creating frankenfood. -Monsanto is responsible for the chemtrails and are poisoning us. -I need to know what I’m putting in my body, even though I should know organic is GMO free, well for the most part. -We can’t trust the FDA, EPA, USDA, and other governmental agencies as it is all a conspiracy. -I have the right to know. The list will go on and on as to why they need a label. The last two statements need to be delved into more because it shows the irony of the whole “right to know” issue. First of all, for many of these activists, including the Babes Against Biotech, when offered information about GE technology, they instantly condemn it. How many people have tried to provide some facts and evidence to much of their claims, only to be banned on their page? The same goes for the GMO free pages also when truly offered the evidence. On Kauai, when Dr. Steve Savage and Dr. Kevin Folta went to offer their expertise on the issues with biotech, they were shunned by the crowd. If the answer didn’t fit their views, they immediately accused both of being paid shills. If it really is about the right to know, wouldn’t these groups demanding it allow for some dialogue? Nope. The other interesting issue to note is this government conspiracy and that the Federal government can’t be trusted. No matter what tests have been done or regulations put in place, these activists have no trust for any of the information. These people don’t even trust the state for that matter. The state did how many tests and inspections with the ag companies to insure safety in the communities. These people refused to believe it, and forged ahead to pass laws on their own because the state had supposedly failed them. I find it very odd that they are now asking the very entity that they never trusted, to now label GM foods. Are these activists suddenly going to become trusting of the state once this label is passed? I highly doubt it. That’s not the true motive behind all of this. Certain lawmakers are sold on the emotional buying point that they have to protect people’s so called rights. By appeasing the activists, it appears as if some politicians are hoping that they will get them off of their backs. Fat chance. These activists are about taking, taking, taking with nothing to give for farmers or ag. In reality, it is far from being someone’s right, but an industry’s ploy to create unnecessary fear against this technology and taking advantage of people’s ignorance and gullibility. They complain about the greedy corporations but their underlying motive is the same thing they condemn. They rely on peoples’ weaknesses and it works like a charm as we all can see. Fear works wonders on an ill informed public, far removed from the growing of food let alone the science behind it. I have a confession to make. As much as I grew up on the farm, I really didn’t pay attention to the things my dad used to do while on the farm. I was busy being the labor and didn’t care much about how or what he did to grow things. I was too busy grumbling about having to work. I now wish I had paid better attention to him now. The last several years has been my own journey to learning how to grow things and what works the best. I have read so many comments that think all of conventional farming techniques are bad. I’ve heard things from activists stating that it is poisoning the land, too much pesticides, organic is the only way to go, and so on. I had to test this out for myself to see what really works. 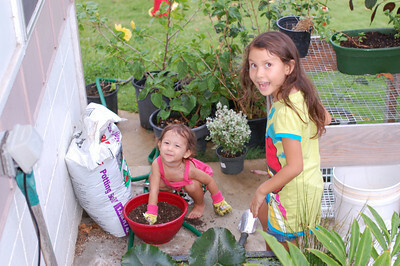 I also feel that it’s good for kids to learn about growing things also. Two years ago, I decided to start an aquaponics system. I’ll just say that it didn’t work out the way I planned it too and it isn’t that easy to do. I learned that this is definitely not going to feed the world or us for that matter. Not to mention that the cost to start one up is pretty steep, which is around $250 for just a small 26 quart set up. I turned into a fish feeding pond for my kids. After that failed to yield, I decided to switch to gardening the old fashion way, but on standing garden boxes. I used the same box as the aquaponics system and designed my own wooden bases to prop them up on. It cost about $100 to get a double garden box set up. I was hoping that my grandmother would take interest, which is why I made it accessible. She didn’t care so I went full swing into it. I placed lots of potting soil in it and mixed some compost in it the first year. We did get some vegetables like lettuce and beets that were decent in size but didn’t get too big. It didn’t taste all to well either. I asked my dad why the things were so stunted and tasteless, and he said that my compost wasn’t fully broken down and it was actually stealing nutrients from the plants because the bacteria was still present. A stressed plant will not yield much or have good taste. Aha! I dug up the stuff in the boxes and decided to let it fallow a bit and started again. I did some MiracleGro like my dad instructed and wow, the difference was totally noticeable. Our second round of beets turned out totally amazing and was nearly 4 times the size of the first batch planted. It also grew in half of the time as the first planting. These were the size of softballs! These were also much more sweeter and fleshier than the first crop. The Japanese cucumbers we grew were amazing also. 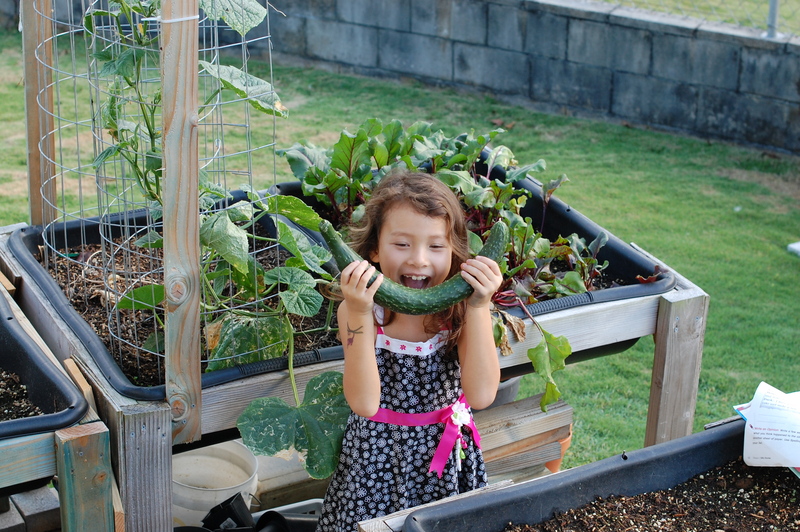 Most of the cucumbers grew inches in a matter of a day and got to be about 2 feet long! My dad told me to wrap the flowers in newspaper to keep the fruit flies from stinging it. If I didn’t, I’d land up with worm infested cukes. He was right because we did get a nice worm eaten one. We got to enjoy about 4 before our dog decided that she wanted to enjoy before we could. The vines were beautiful and really vigorous to start but after the cucumbers came out, I noticed that the ants and the aphids came along for the party too. I only had 2 vines and still had to spray it. Duocrops do get pests. Lesson learned. By the time my dad, the plant doctor, saw it, he said that I had missed the exponential curve of the bugs. He said that I needed to time to spraying of soap water before the population exploded or it would be too late. In no time at all, the vines were invested in pests and eventually destroyed by the bugs, no matter how I sprayed. I missed the right opportunity. Lesson learned. 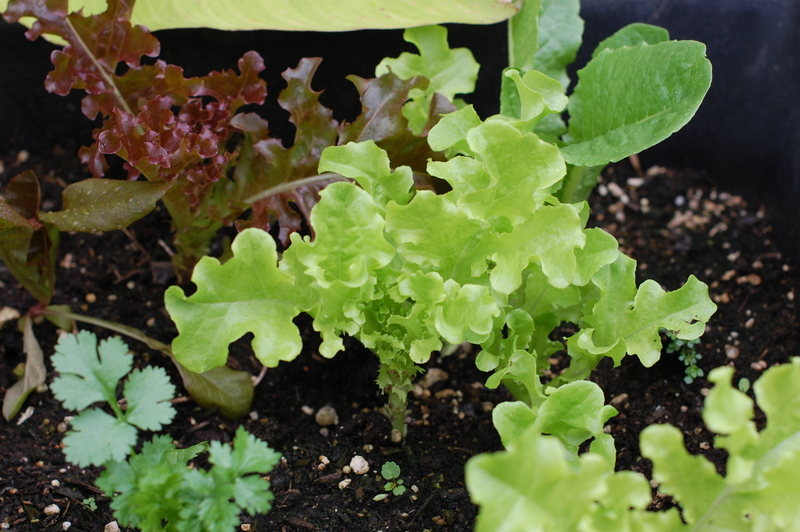 The lettuce box was much more successful the second time around after the compost had been completely broken down. My dad reminded me that I’d better put some snail and slug bait around or risk rat lungworm disease. Yet another lesson learned why we need substances with effective pest control chemicals in it for growing our food safely. After growing a season of lettuce, cucumbers, and beets, I dug out and rotated the soil and to my surprise, I found earthworms! So many people think that by growing conventionally, one is killing the soil. Not so! These worms were huge, with some measuring over 5 inches long! 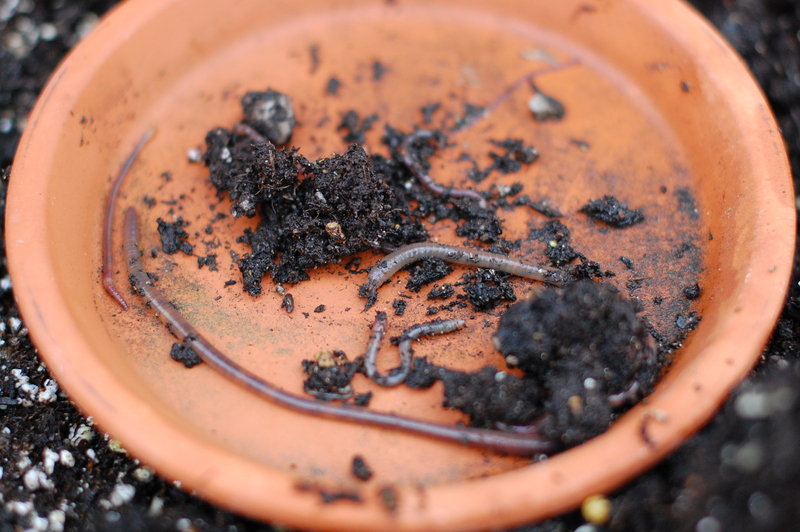 I didn’t use any manure and used MiracleGro and yet there were these beautiful worms. 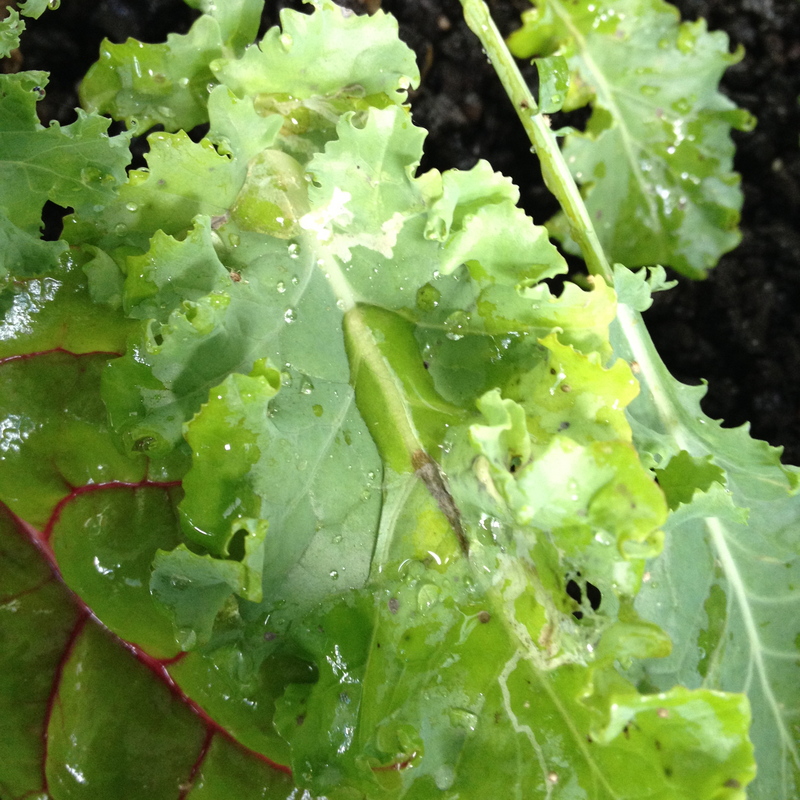 Later on, I did attempt kale but that was a major fail because I discovered that the bugs love it. 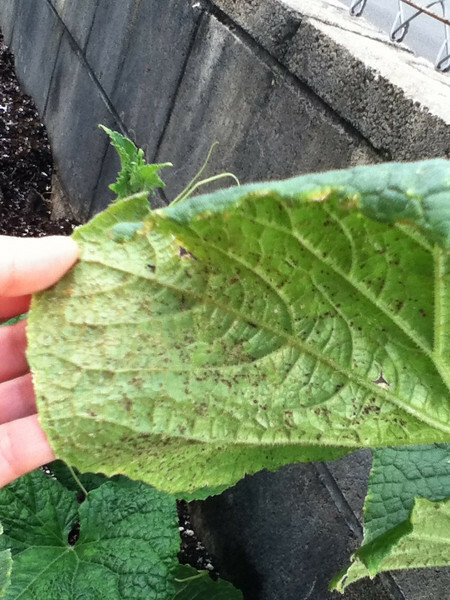 It was covered in aphids and caterpillars constantly, as well as needing multiple spraying to keep it free of bugs. My kids looked at it and said, “Gross!” The guinea pig and dog got lucky and got most of the kale that we managed to save. Yet another lesson learned was why every year there is new seed stock in the garden stores. After our basil plant seeded and spread all over to the other boxes, I discovered that they subsequent generation of basil was not exactly like the first. I asked my dad and he said basic genetics. Light went on in my head. Aha! If you want the best traits of the crop, you have to get new seed each year, if not, you won’t know the next time because of the genetics may or may not be the same. After going through this experience, I’ve come to realize that growing food is not that easy. It is easy to sit on the internet and read something that tells you what kind of farming is better. Until you actually grow it, you’ll learn first hand what works and what doesn’t. The pests are ever present and ready to destroy your small garden and if not controlled, you get nothing. The same applies to farms big or small. My garden has taught me that it takes a lot of skill to grow things and until you do it, you’ll know the truth. A garden is just that, a garden. To be successful at gardening, does not translate into expertise in farming. Unless one grows all of their own food and enough food for others, respect the farmers because they have that magic touch to do what they do for us each day we sit to eat. 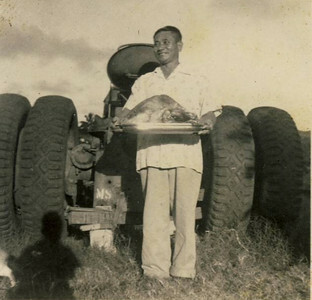 My grandfather, Thomas Kamiya, who started up the farm as his livelihood. I decided to take some time off and enjoy myself. I took my daughter to go and see the Lion King that is playing here in Honolulu. I saw it 10 years ago in San Francisco and forgot about how wonderful that show really is. From the intricate costumes, colors, music, artistry, and puppetry, it is one of the best shows around. -The nice homes and buildings we live in. Someone had to feed the architects, masons, steel workers, plumbers, contractors, lumber workers, carpenters, permitting people, electricians, cabinet makers, carpet layers, flooring specialists, window makers, painters, and truckers so that our homes could be built. -The cars we drive to take us where we need to go. Someone had to feed the engineers, steel workers, welders, mechanics, auto painters and workers, the glass makers, the upholstery crafters, rubber makers, safety inspectors, and oil workers to make our cars and keep them running. -The wealth of communication options we have with computers and cellphones. Someone had to feed the computer designers, chip makers, programmers, component parts makers, electrical engineers, patent specialists, graphic artists, plastic makers, alloy metal workers, and operators to keep our lines of communication open. -The roads we drive on to and from our journeys everyday. Someone had to to feed the asphalt makers, road workers, stripers, traffic light engineers, electricians, heavy machine operators, civil engineers, budget managers, and concrete workers who put that road together for us. -The schools that our children go to. Someone had to feed the people who built and maintain the school, the teachers, the janitors, the administrative staff, the cafeteria workers, and superintendents who run the schools to educate our children. -The constant access to fresh running water and power. Someone had to feed the people who built the infrastructure of pipes, engineers, scientists who know where the water comes from, the heavy machine operators who laid the pipes, the helicopter pilots who carried the lines over the mountains, the pole workers, and people who monitor the power and water to keep it on. -The freedom from preventable illnesses. Someone had to feed the scientists who had time to search for a cure, a chemist who studied solutions to hold the vaccine, nurses to give the vaccine, the biochemist who figured out how to make large quantities of it, doctors to educate people about the diseases, public health officials to monitor for outbreaks, and companies who made these vaccines available to the masses. -Access to the culture and arts. Someone had to feed people so that they could have the freedom to get off of the farms and develop their creative interests in making musicals, choreographing plays, singing, dancing, set making, story writing, and other forms of art and entertainment. -Travel around the world. Someone had to feed people so that Wright brothers had the ability to design the first plane, study aeronautic engineering, workers to build the planes, and pilots to get one to his or her desired destination. -Have a hobby garden. You don’t have to grow most of your food because a farmer grew it for you. Nor do you have to raise and kill animals to eat. 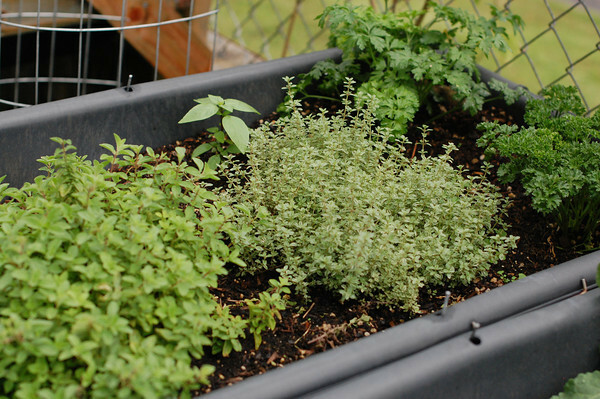 You have some time to work a real job and make more money to start up a hobby garden that brings some fresh produce to your table. If it weren’t for the ingenuity, efficiency, and sustainability of our farmers, we would not be lucky enough to have the kind of lives that we do. We never have to worry about whether our crops are going to be able to feed us or be decimated by disease. We have constant access to food and just have to walk in the store to pick it. We don’t even spend the majority of our lives growing food because we don’t have to. We have so much time on our hands to do other bigger and greater things. It’s all thanks to those creative and hardworking folks called our farmers. It’s really sad that some folks, who benefit from the farmer’s hard work, have decided to protest and disrespect this very work with false information. That’s simply not right. If you feel the need to protest, remove all of the modern technology in your life because it was all started with the work of a farmer. If you long to go back into the “good old days,” you should live in it and see for yourself how life really was. Get off the computer, turn off your power, stop driving a car, stop using running water or any of the modern conveniences of life. Stop shopping at the grocery store and produce all your own food, if you can’t appreciate what the farmer has done for you. For lawmakers who want to turn back the hands of time on farmers, they should live the way they propose to legislate and then see if that is the right path to take. Then ask your activists to get out of their Waikiki apartments and live the life that you propose. The experience will be a true wake up call for most, who have never spent a day on the farm. There won’t be any time for marches because you’d be working on the land and preventing the pests from attacking your food. A real farmer knows all of that too well. Just remember, that you would not have that nice life you do today if it weren’t for all the people that were fed by that farmer.